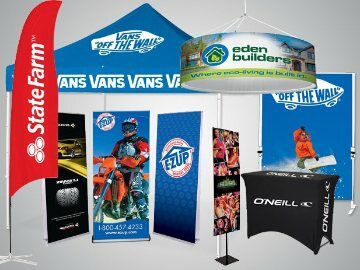 Promote Your Brand, Business or Event with Custom Printed Signs, Flags, Banners and Displays! 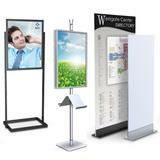 Are you looking for custom printed rigid signs, indoor and outdoor vinyl banners, table covers, banner stands, branded event tents, flags and displays for your business, storefront, trade show, meeting or event? We are your nationwide, online and local sign supplier for high quality digital, large format and direct printed signs, banners and retail display marketing products. Logo Executives has many sign making capabilities to make custom signs of all kinds for your business in Las Vegas and nationwide. We offer many different sign-making processes in order to get your business or store a quality custom sign. We offer direct printing onto substrates such as wood, metal, plastic and foamboard as well as custom router cutting to give you dimensional signs or 3D logos and signs for your trade show booth, store or product display. Large format and super wide format printers let us print your larger and over-sized indoor and outdoor signs, banners, wall wraps and displays. From banners and flags to custom cut logos and printed signs, Logo Executives can make your Las Vegas sign design a reality. Whether for your new store front or for your Las Vegas trade show booth, we can make your custom sign for you with all the best materials and sign printing processes available in Las Vegas. Contact us with your next Las Vegas custom sign project or to get a free quote on your custom Las Vegas signs call us at 702.589.6429.